My birthday is my favorite day of the year. No matter how old I get, I still celebrate like I am fifteen! This year was no exception. A group of us were at the Escape Room at Oasis Fun Center. 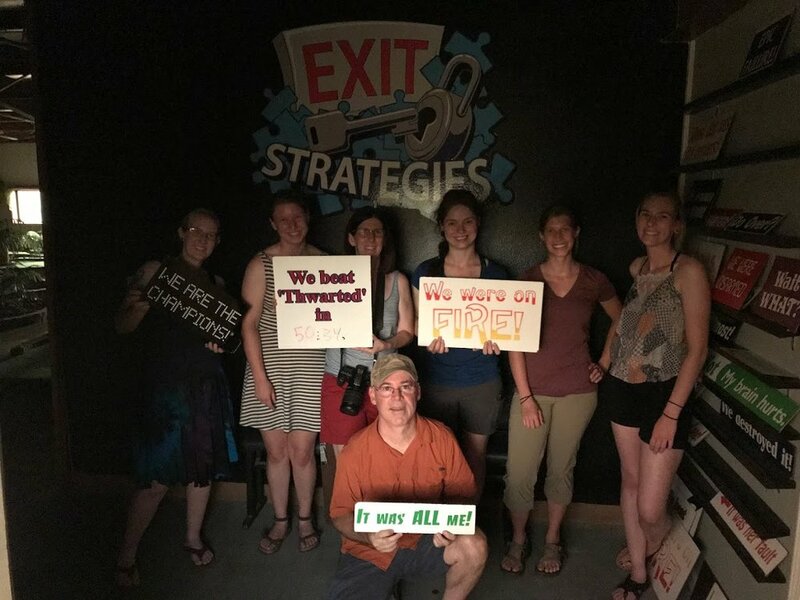 We had about 15 minutes left to beat the room and the lights went out. “That’s not part of the game” the voice came over the walkie. “Do you want to finish anyway?” he asked. We all had cell phones, turned on our lights and finished in the dark, with ten minutes to spare. We decided to take the party to my house, but we had no idea what was going on outside those doors. It was Thursday, July 26, 2018, at 8:25 pm, we had just stepped into my house when I got a call from Carrian, Turtle Bay’s Guest Service Officer, who had made a stop on her way to my house. "Get to Turtle Bay now, get the animals out, now, hurry!” she said. Carrian was standing on the Sundial Bridge and watching the flames coming towards her. From her perspective, there was no way to tell if the fire was 10 miles or 10 blocks away or how fast it was moving. We all jumped back into our cars and rushed into the Park to start our evacuation protocols. Looking back now, it is so unreal. As we were running around packing up animals, I couldn’t believe how well each mammal kenneled when we asked. With our adrenaline pumping, they surely felt that something was wrong. A few hesitated, but it was going well. The staff communication was extraordinary. We all knew where each other was and the status of each animal and location. As the time clicked by, we got phone updates from Carrian who was looking out and letting us know our safe time. "Hurry, you guys need to finish up!" was one of the calls. 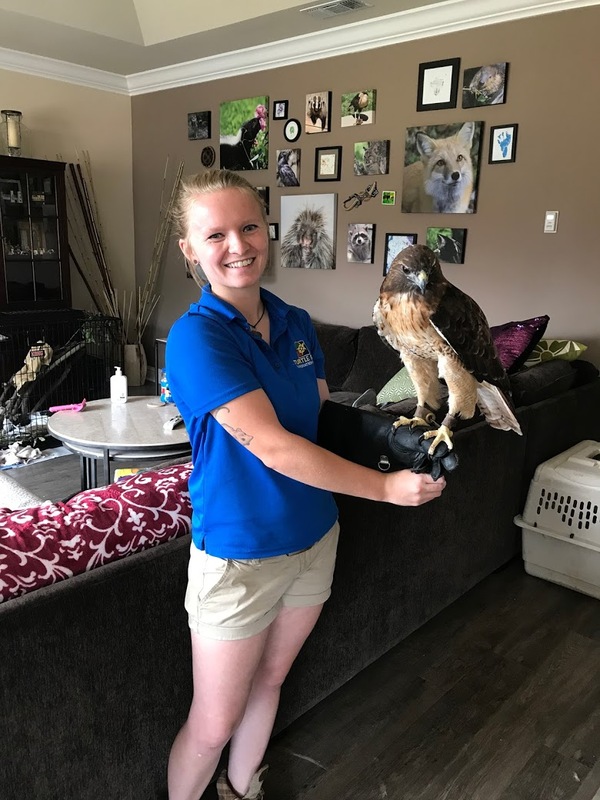 Wildlife Woods and the Mill Building were clear except for Seteweela, the Golden eagle, and as I enter the kitchen Melissa from Guest Services is there helping to load up the non-animal supplies, emptying our fridge into coolers and loading supplies. The phone rings and it is Liz from our Development department asking if we need help. I don't even know at that point so I just tell her to come in case we do. 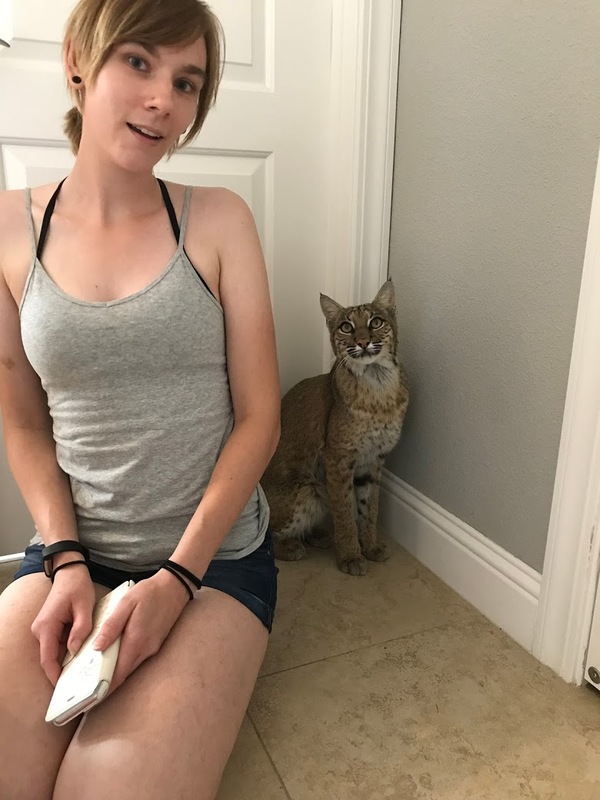 And I am glad she did because in the middle of gathering up animals we got a call that several animal care staff members had to leave and go evacuate their own homes. But the rest of us kept going. 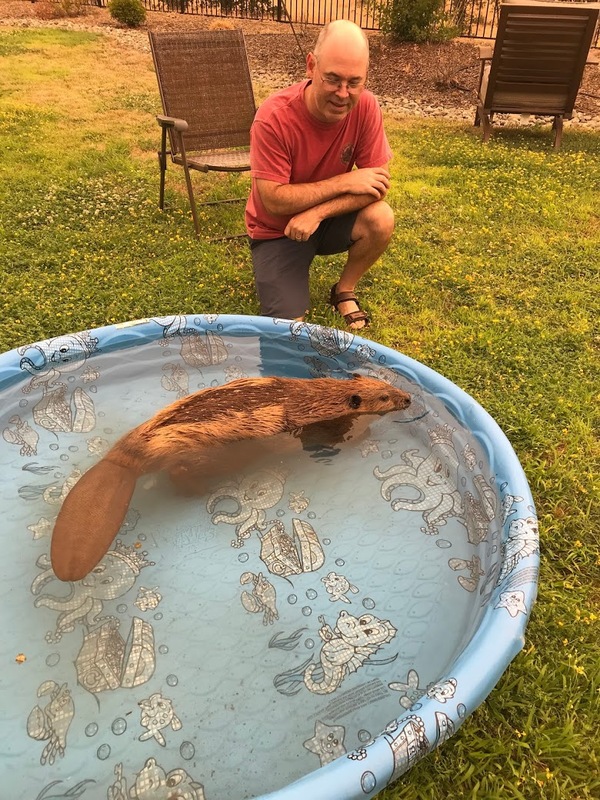 Garrett, our Aquatic Keeper, and my husband Wayne were working together to pack up the Museum animals and I headed over to help get Timber, the beaver, and the Bufflehead duck who would not kennel. Trying to stay as "routine" as possible so that Timber would get out of the water was like asking a fish to walk on land! But we did it, we all sat down on the concrete as calmly and quietly as possible and just waited for him to come out to sit on our laps. It felt like an hour but was probably 2 minutes. Once we had all the Museum animals, we headed back to the Forest Camp. Ash was falling on us like a light snow and burned paper landed on the ground. All the animals were kenneled and ready to go except the lorikeets. There were still about a dozen who we were unable to get into kennels. Carrian was now there with the Exhibits van, so we had room for them once we got them. Carrian, Liz, and Melissa along with the remainder of the animal care staff started loading vehicles while Kyla, Garrett and I worked on the rest of the lorikeets. "You guys have to finish" insisted Carrian. "We are almost done," I reassured, but honestly was terrified we would have to leave some behind to burn. It was at that moment that we were so determined that we just started grabbing lorikeets out of the air! I would swing a net to scare them and they would fly right into Garrett's hands! One after the other we tossed them into kennels. The only two left were the large Black-cap lorikeets, which were out in the main area. We walked around to find them in the dark and found one in the upper corner, too high for any normal person to reach. Thankfully we had Garrett! He slowly approached and then...BAM, he grabbed the bird off the perch, “ouch, ouch, ouch” I hear, as the bird is latched onto Garrett's hand. We quickly help him, get the bird in the kennel and repeat with the very last bird! 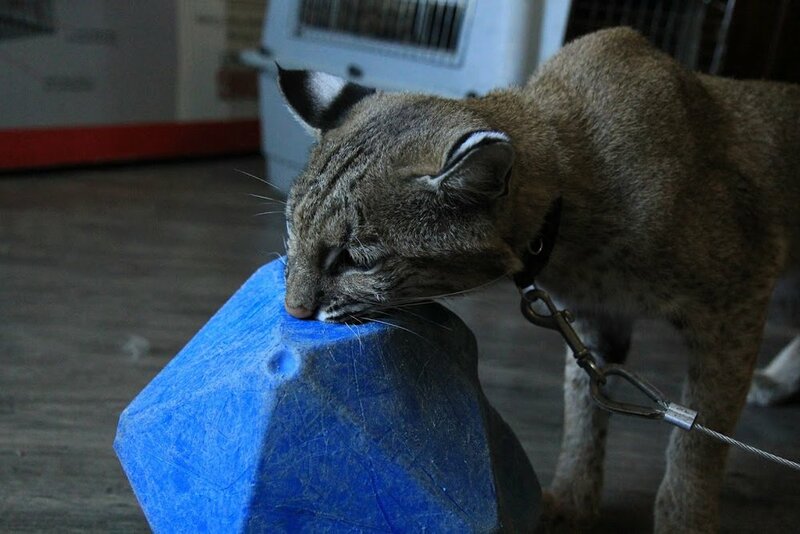 We rushed the last cages to the vehicles, I ran around the kitchen grabbing some last items. As I closed the door to the Mill Building kitchen I took a deep breath, said "Goodbye, I hope to see you again" and locked the door. I think I was in shock as I drove down the road. My cell phone rang and it was Mike, my boss. "How are you?” he asked. As I broke down and cried I repeated over and over, "We got all the animals out, we got them all out"! A caravan of 8 vehicles drove out of Turtle Bay with 87 animals. The animals are out, what now? I didn’t know where to go. Was the fire just going to blow across the entire City? It was 10:30 pm and the pre-arranged places we had to help with evacuations were also evacuating. First stop would be my house, as I live on the far East side of town and the fires were on the West. As we all pulled up to my house and got out we just stood in the driveway wondering what was next. Everyone was looking to me to say what to do, but in 30 years of working with animals, this was the first time I had no reference point. I had no idea at all but I had to make a decision. We all bounced thoughts and decided that we were far enough away to make it to morning so we would just bring all the animals into the house and figure out the rest later. My neighbors all saw us pull up and came to the house to give their support. Staff had to leave to go check on their own lives, “What if we have to evacuate again?”, “I can’t get them all out”, I said. All of my neighbors said, “We’ve got your back. If our neighborhood has to go, we will get the animals out!” The support during this whole ordeal was mind-boggling. I got on Facebook to a zoo page and posted asking if any Northern California facilities had space, in case we needed to leave again. The outpouring and support were inspiring. We proceeded to unload all 87 animals into my house. “Put the eagle in the walk-in closet”, I directed, “It will be quiet in there for her”. 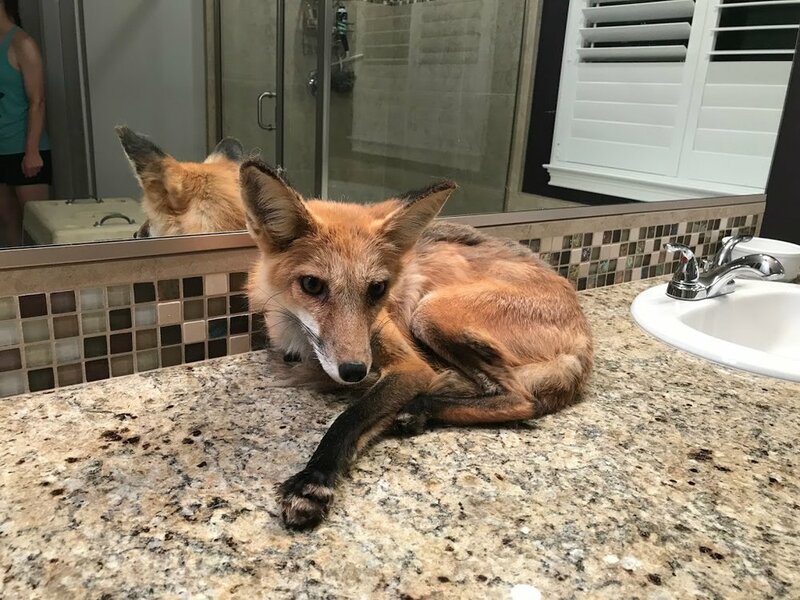 I directed the team to place the foxes into the master bathroom, the weasel in the toilet room, and used the hallway closet door to make a safe space for Nashi, the raccoon. “Stack the reptiles in the hallway and make sure Ned gets some privacy”, i instructed, as people paraded into the house, kennel after kennel. “What about all the lorikeets?” someone asked. “Just line them up in the garage”, I responded. We set up one of my trainers in a spare bedroom with her dog and cat, as she had personally been evacuated. It was now 1 am and everyone else had gone home. Many of the mammals stress soiled their kennels and needed to be cleaned so that they didn’t have to sit in their own filth and we had only one extra kennel. The two of us spent the next hour and a half switching the fox into the kennel, cleaning his kennel and switching back. Then the other fox, raccoon, badger and so on until every one of them had a clean place to sleep. Just as we thought we were done, Adrienne texts me, "we are evacuating, we are on our way over”. We set up the other spare bedroom. 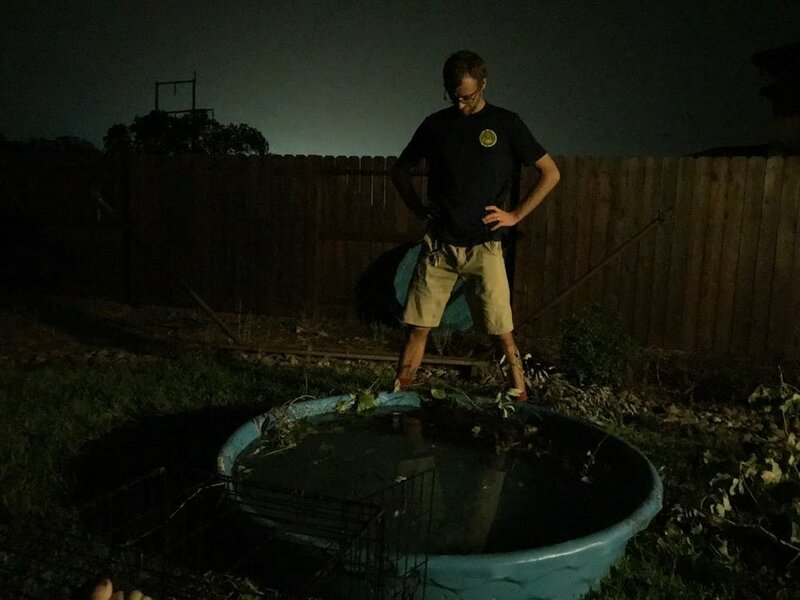 At 3 am, Adrienne, her husband, her 2 dogs, 3 cats and 7 reptiles joined our makeshift zoo. Incessant scratching from Loki woke me up at 4:30 am. Staff started arriving at 6 am to care for the animals. That first day was quite a challenge. It took all day to clean, feed and exercise all the animals but as the days went on, we started getting a new routine. The mornings were for shifting the animals to clean kennels, cleaning, and feeding. The afternoons were for exercise. 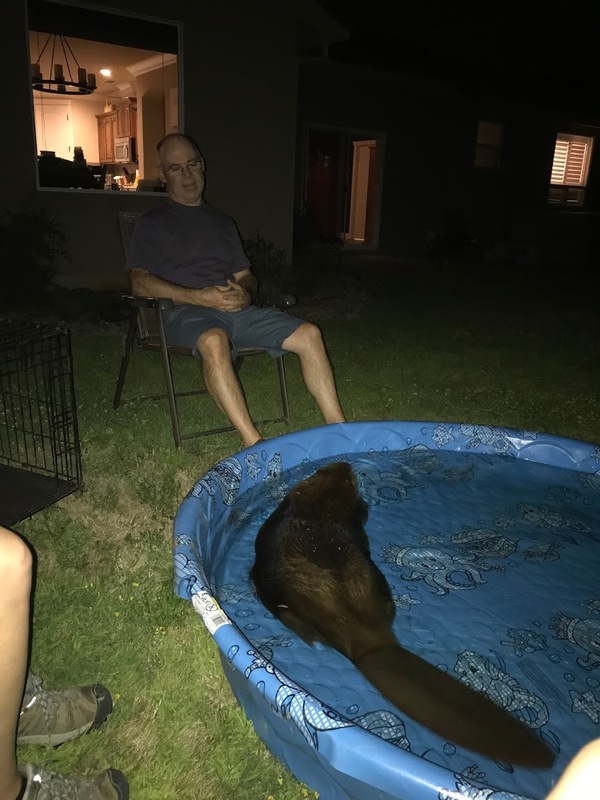 Timber however required 2-3 times a day to come out and wander the backyard and go for a swim in the kiddie pool. By day three I think we had it pretty much figured out. The staff was working staggered shifts so that we had someone here with me from 7 am to 11 pm every day. It really was quite the sight as we had to get creative to get all the animals out for exercise. 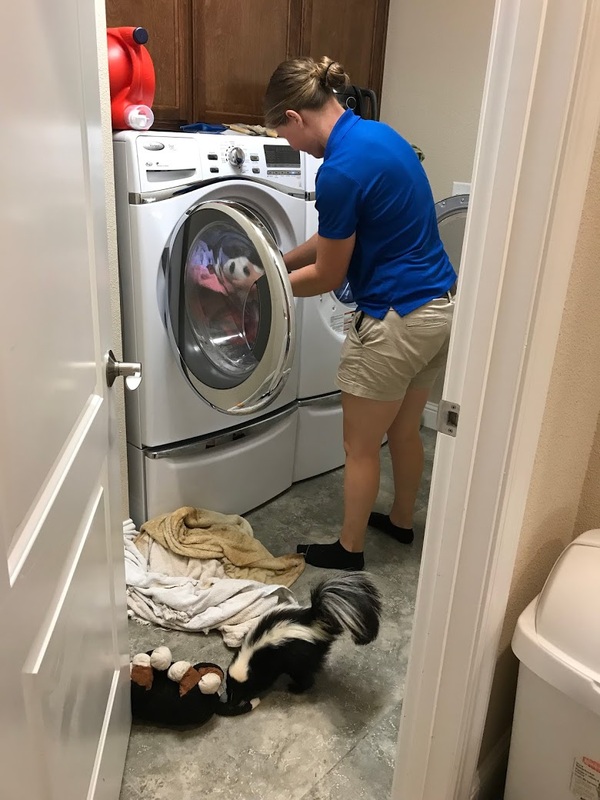 We barricaded the laundry room to make a play area for Sweet Pea, the skunk, and when she wasn’t there, it became a safe place for the birds to get out and stretch. 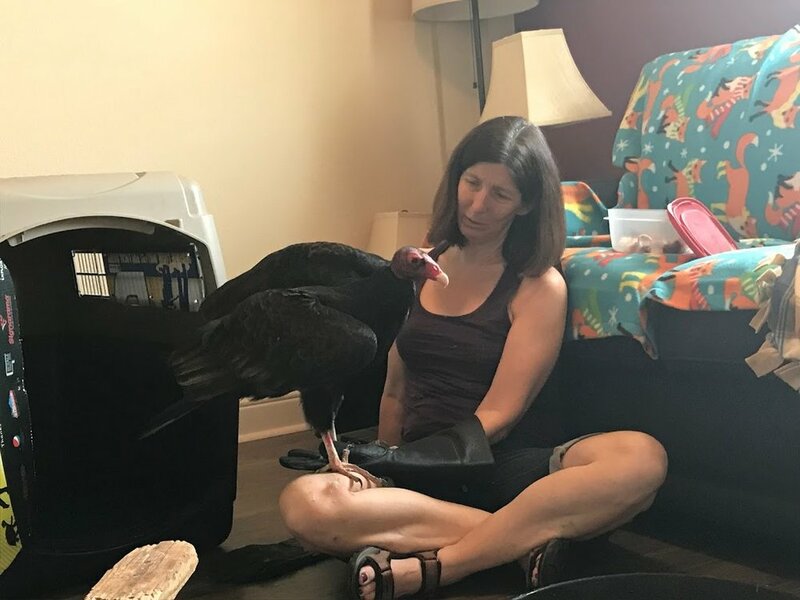 The spare bathroom was also a great place for the birds and Ned, the Black vulture, really made himself at home as he would fly up to the shower door and spread his wings for hours! 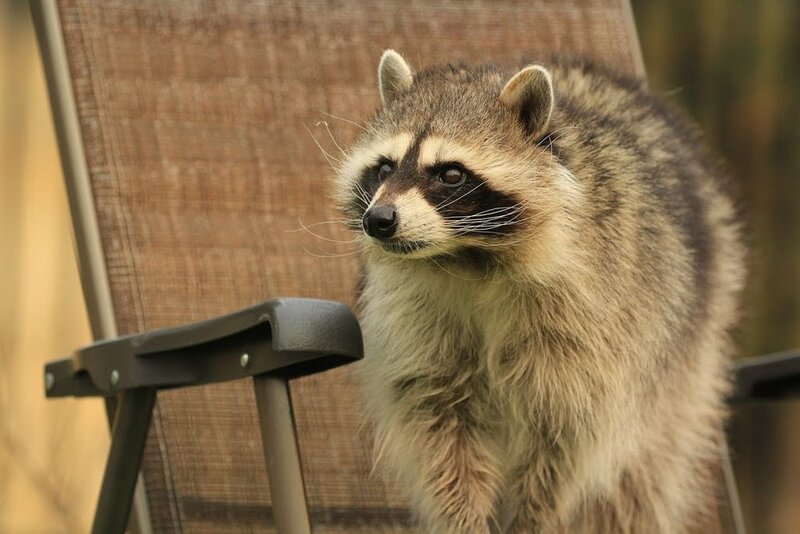 Our fenced in backyard was perfect for the mammals to explore. One at a time we would let them out. Nashi loved the hose bib while the Digger, the badger, dug in the pile of soil we had brought in for him. By day four we knew we were safe at Turtle Bay from the fires, but the smoky air quality was another story. We couldn’t bring back any outside animals until the air quality improved. As we all know, smoke can be pretty deadly itself. The Mill Building had so many cracks and crevices that the air was almost as bad in there as outside. But on day ten the air quality had improved enough to get some of the mammals back. It was at this point we slowly brought animals back to Turtle Bay. Then, we packed all the doors and cracks with towels, plugged in an air purifier and got the Mill Building set for most of the birds. 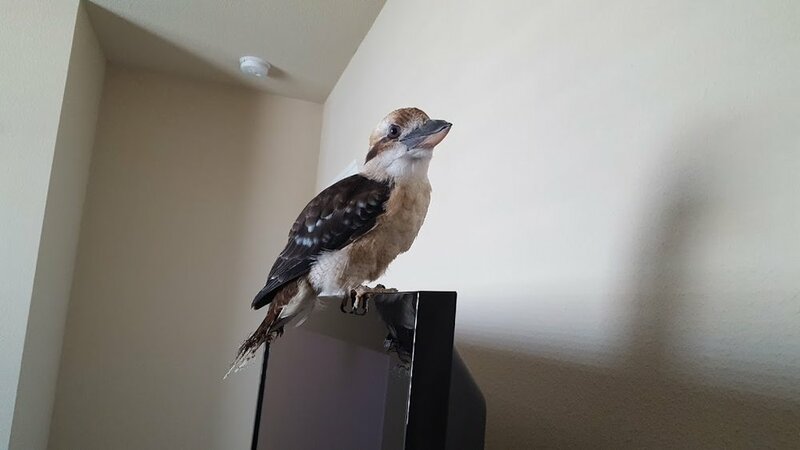 Here we are 3 1/2 weeks later, the Carr Fire is 88% contained and there are still 36 lorikeets and a bobcat at my house. The air quality goes up over 300 and down to 95 like a rollercoaster ride that just won’t end. Our new normal is to put all the animals out in their habitats when it is low, and then go pack them all up and bring them inside when it goes high. We do this every single day. I know that it will be back to normal soon and we are so thankful for all the support we have received. Evacuation drills and capture techniques were all things I never thought I would have to use. 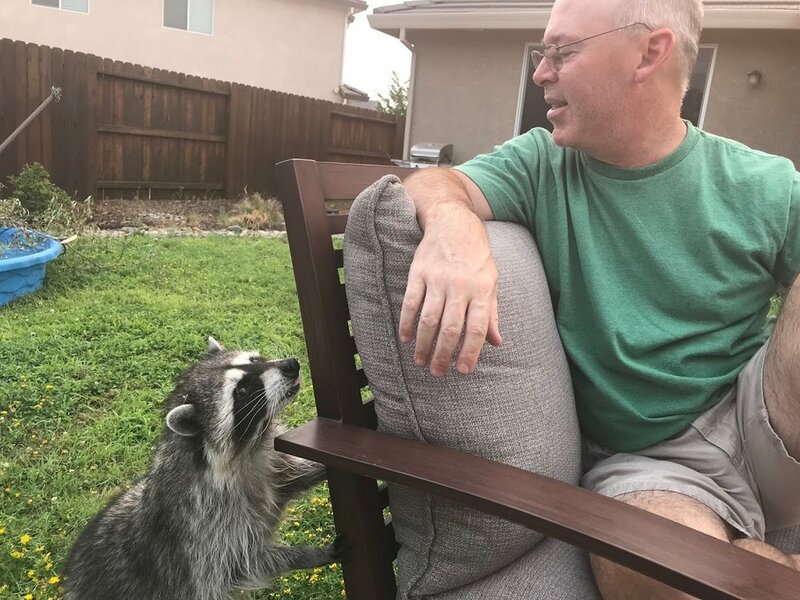 I can’t help but think that it is all of my years working with animals that brought me to this point where I had to use all the skills I had learned and all the training I have done. But I will tell you one thing for sure, this is one Birthday I will never forget! 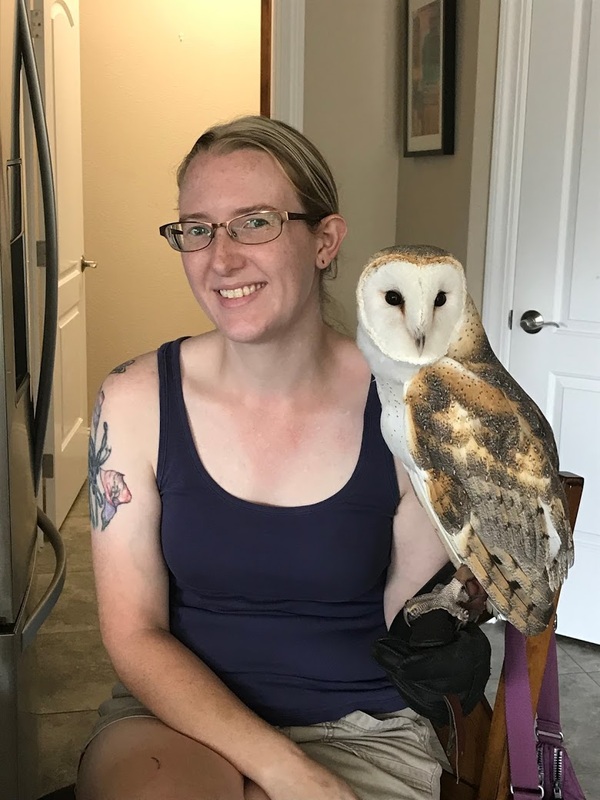 Adrienne John, Assistant Curator of Animal Programs. Adrienne is my second in charge and my right-hand person. I could not have gotten through this without her. Carrian Foster (Guest Experience Officer), for making sure we were all safe that night, being ready for anything we needed at a moments notice and continuing to monitor and support us for weeks after. Melissa Maney (Guest Services Lead), for coming out of nowhere that night and being a part of the team. Turtle Bay Volunteers: In particular, all of our teen volunteers who still showed up to help at my house and Turtle Bay. And to Bruce Gillette for making a special delivery of soil for the animals in my backyard.